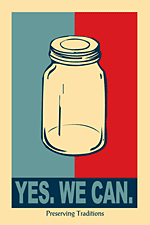 Preserving our harvest, our heritage, our community, and our future. 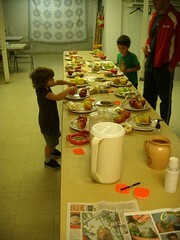 Today (March 11, 2012), we held a maple syrup tasting at the Pittsfield Grange, and it was a lot of fun! Maple syrup is one of the great examples of terroir – the way the conditions of a specific location affect the flavor of particular foods. Over 30 people came to try a slew of syrups, dipping pieces of pancakes as saucers of sweet goodness were passed around the table. Folks found they all had different likes and dislikes. Some preferred lighter flavors; others preferred a more robust flavor. The people who like really strong, complex flavors also tended to like the hickory syrup more than folks who like the lighter syrups. 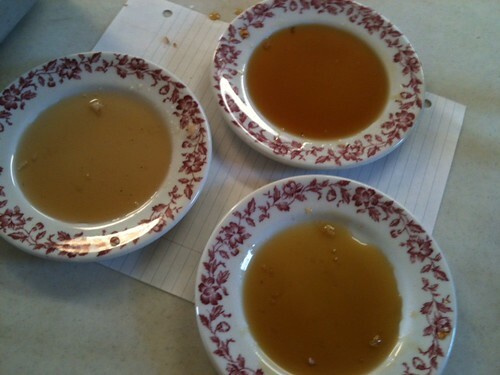 Most folks agreed that the syrups that were predominantly sweet, with little complexity, were just plain boring. And the only people who liked the super-cheap syrup bought at Sam’s Club (which was super-sweet and thick, and so stridently maple-y that many folks thought it had artificial flavor) were under the age of 12. Appleschram. This orchard in mid-Michigan is more generally known for its cider and pastured pork, but their maple syrup was a crowd favorite. A fairly dark syrup, the group described it as tasting “a bit like caramel, almost smoky, with a strong finish.” We found it at the Ann Arbor Food Co-op. Shady Maple Organic. This medium-dark syrup is from Quebec – home of 75% of the world’s maple syrup production. Not quite as popular as the Appleschram and Kelly’s (below), it still had its devotees, especially among the light-syrup aficionados. Despite being lighter in flavor, it was fairly rich and complex, with smoky undertones. This is a fairly easy syrup to find; we got ours an the Ann Arbor Food Co-op. The most resounding and uniform praise came for a pair of syrups from The Kelly’s in Dexter. Literally a mom-and-pop syrup operation, the Kelly’s tap their trees with tubing and boil it over a wood fire. We tried both light and dark syrups from 2011, and most people loved one or both. The flavors were noticeably more complex than most of the other syrups. The dark syrup (from the end of the season – early-season sap yields lighter syrup) had an almost molasses-like flavor. Neither came across as being overly sweet, which was preferred by most tasters. Do yourself a favor and seek them out at the Dexter and Saline farmers’ markets – it’s really a treat! Overall, it was hard to discern hard-and-fast trends to finding a really good syrup. More people preferred darker syrups (often marked grade B) than light ones (grade A). More of the small sugarbushes had lots of fans, compared to the big commercial sugarbushes – but two of the small varieties were considered “boring” and one of the big ones was liked quite a bit. Even production type wasn’t necessarily a deciding factor – some of the wood-fired ones were great, and some were so-so, and reverse osmosis wasn’t a “big bad,” either. Preserving Traditions member Lauren Zinn is now giving educational tours of southern exemplary Michigan farms. Here’s the info – check her out! • Experience guided tours of working urban, suburban and rural farms. • Learn how sustainable practices are making a difference. • Engage in inspiring conversation with the stewards and farmers whether they manage 400 acres or 400 feet. • Develop ideas for applying sustainable practices in your own life. A 2 acre farm including horses, goats, chickens and a garden serve as an alternative biology and chemistry lab for the pregnant teens who attend this school. Imagine the possibilities for all schools. This small, efficient farm of 5 acres includes horses, a garden, woods/pond and features energy conservation/green building and the social structure for intentional community living. Experience the horsepower behind this little place. Tour a residential backyard of chickens, goats, rabbits, garden, and greenhouse– all thriving! Learn the secrets of efficient and sustainable micro-farm management. Amish style houses and a wind tower built from scratch grace this 380 acre property in Amish country. See the Barn become a hands-on renewable energy classroom. Learn how an alternative approach to science education can lead to innovative and sustainable solutions to global problems. School group agritours are also available. 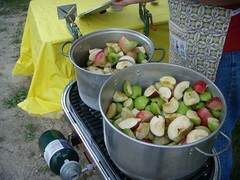 Sept. 26th was Apple Day at the Grange. * This is an annual event that features all things apple. Inside, we had an apple-themed bake sale. 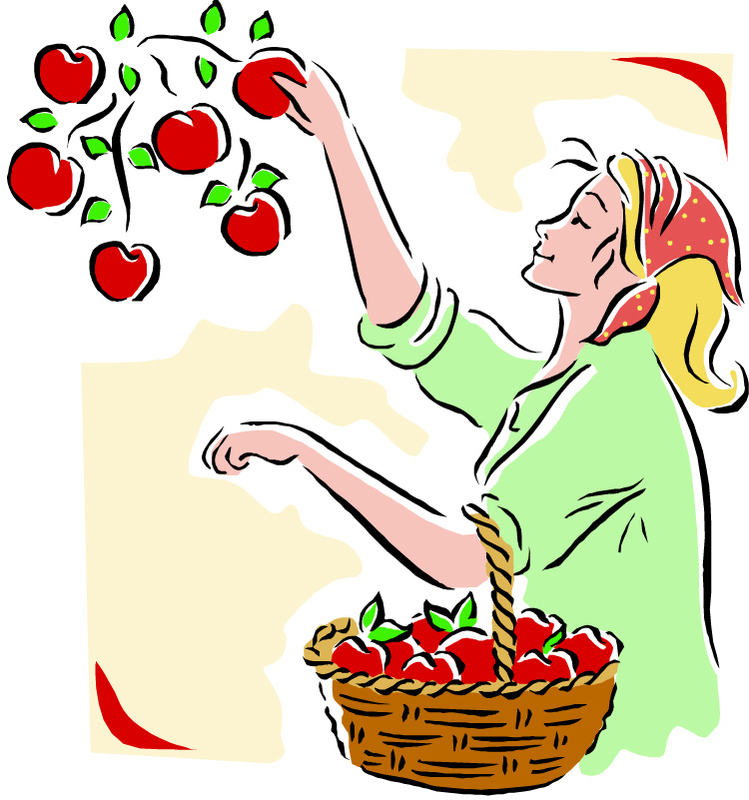 Apple-rhubarb pie, a variety of apple cakes, apple baklava, and any number of cakes and cookies with applesauce in them. There was also an apple tasting – 15 or so varieties of apples, both fresh and dried crispy, many of which I’d never heard of before. And finally, some craft activities and displays (including one on food preservation methods that I set up). *We’re talking the real Grange here, the Pittsfield Union Grange, not the new restaurant in downtown Ann Arbor. Tammy’s Tastings Supper Club – Preserving Traditions Benefit! Tammy Coxen of Tammy’s Tastings is Ann Arbor’s guru of ganache and doyenne of delights both sweet and savory. In addition to creating some of the best handmade truffles I’ve ever eaten – flavors like fresh garden mint, rosemary-lemon, and salt caramel – she’s a fabulous chef of dinner-type foods as well. Dinners will also benefit local food groups, and she’s chosen Preserving Traditions as the first recipient! I will be helping her cook and serve the meal, and will probably say a few words about the group, but don’t worry – I won’t talk your ear off. This is really about the food, and experiencing Tammy’s creative style and exquisite execution. Please see Tammy’s blog entry Tammy’s Tastings Supper Club for more information and to reserve a spot at the table June 6th. Just found out about a new swap list called Veggie Trader. Think Freecycle for garden produce! There’s not much there this time of year for our area, but there is a place where you can plan to specialize. For example, I’ll grow tomatoes and you grow cabbage, and we’ll swap come harvest time. It will also come in handy when we find ourselves buried in “whatever” later this year and want to trade it for “whatever else” someone in town might have. Visit the Store to get your “Yes. We Can.” goodies!